Hello everyone, it’s your dumb, friendly, neighborhood Jank-Crafter here to change things up and write a set review. I normally stay away from the color White in Magic, so this was an awesome change of pace to write this! Battlebond looks like it’s going to be awesome and hilarious for all different kinds of players, especially those who enjoy doing dumb things (like me). I just got back from a trip in the Galapagos, and was so excited to go through all the spoilers I missed while I was gone, and can’t wait to play it! So I hope you grabbed your mask, snorkel, and fins, because we’re going to dive right into this set with out new mono-colored partner commanders! We only got two mono-white legends this time around, and they both have Partner With. However since this review is about the color white, we won’t be discussing their other halves, especially with Nate Burgess’s article the other day covering the partners. Sylvia is pretty self-explanatory and two-dimensional. She is a commander that buffs dragons, but there are very few mono-white dragons that are useful in commander. I see her being used in the 99 of basically every dragon tribal deck with white, because double strike is FEARSOME on dragons, but not much else. 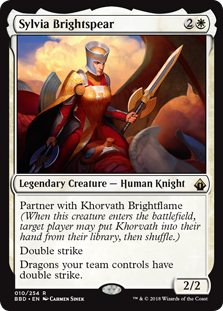 There are already many options for dragon-matters commanders, most of which are better than Sylvia. Our second mono-white legend is interesting. She seems decent in the 99 of decks like Trostani, Selesnya’s Voice and other lifegain strategies. She also could be very well used in decks like Rhys, the Redeemed that rely on token generation, but it needs to be one that specializes in lifegain as well because Regna won’t generate tokens unless you’ve gained life. Her partner built as a commander will be really interesting, but again there is more on that in Nate’s article. When it comes to talking about the new cards that will impact commander, there’s only a few notable ones in each monocolor in each set. In white, there are four major cards I want to focus on. Without further ado, let’s start this off with a bang. Arena Rector is a jaw-dropping addition to our list of white tutors. Obviously inspired by the very well known (and very expensive) Academy Rector, Arena Rector does the same exact thing, but grabs Planeswalkers instead of enchantments. Never before have we had a card that tutored specifically any planeswalker in your deck, followed by putting it on the battlefield. 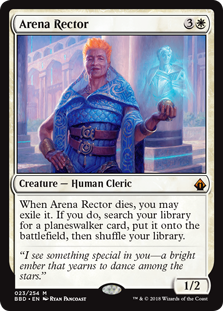 The closest we’ve had to Arena Rector is Call the Gatewatch, and Djeru, with Eyes Open, both of which just tutor to your hand. Now we do have Samut, the Tested, but I’m separating her from this considering she is a planeswalker herself, and it’s her ultimate ability, and EDHREC has her listed in only 533 decks at the time this article was written. 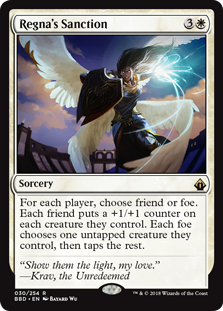 Arena Rector will be found in any decks that use the superfriends theme, as being able to tutor any of your planeswalkers to match your given situation can be incredibly useful. 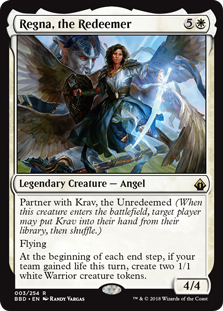 Commanders who will love this new addition include Atraxa, Praetors’ Voice, Narset, Enlightened Master, and really any deck that is white and has a planeswalker as a win condition or game ender. One interesting tactic I’ve seen a few people discuss, and is worth mentioning, is the potential of using Arena Rector with a card like Flash. Throwing down a Ugin, the Spirit Dragon, Karn Liberated, Jace, the Mind Sculpter, or ANY of the Nicol Bolas planeswalkers, to name a few, on turn two would be devastating in any game of commander. Casting a 7-8 mana Planeswalker that early can be game ending. Our next card certainly lives up to its title. Play of the Game is not just a boardwipe, but an exiling boardwipe, that can become cheaper if another player helps! Assist is going a be a very interesting political mechanic for Commander players, and one that I hope we see more often. Bring Down is another example of this that will definitely see more play in Limited, but it’s interesting to have a kill spell or boardwipe in hand, and bargain with other players or team up to get rid of something that affects more players than just yourself. Being able to pay four to exile the board, including all nonland permanents, not just creatures, while another players pays the other four mana in order to shut down a threat is an absurd thought. Like Assist, Friend or Foe is another aspect of cards that I hope we see more of in future sets. It is another political tool to temporarily ally yourself with other players. If one player is clearly in the lead and others are willing to work with you, helping them out with this spell can be beneficial in the short term, as long as you don’t let it get out of hand. In the case of Regna’s Sanction, giving a +1 counter to each creature when the player only has two or three creatures can be a better political move and relatively low-risk effect compared to completely opening them up to attacks by tapping their creatures down. Speaking of which, Regna’s Sanction actually opens the door as a game ender for white. Being able to tap all creatures but one for each player can definitely lead to ending the game that turn if you have the boardstate to finish them off, especially after you buff all your creatures. I expect to see this card played in decks like Rhys, the Redeemed where you can pump all your creatures and tap all your opponents, and other token-centric and combat heavy decks. Together Forever is going to be a very niche card. There are very few non-Atraxa decks that fiddle with +1/+1 counters and are white. 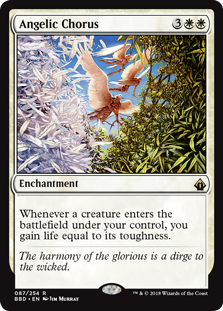 Sure, there’s some playability with Anafenza, the Foremost, but our other +1/+1 counter commander with white is Ghave, Guru of Spores, for whom this ability isn’t really relevant. However, something interesting to note is that this card does, in fact, not specify +1/+1 counters. I expect this card to be seen occasionally, but not to make a huge impact in the format. With a supplemental set we get lots of new reprints! There are some amazing options we are getting from all colors. 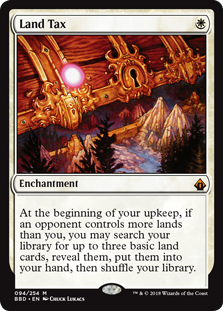 White has 3 that we’re excited for and are going to have a big impact on Commander. FINALLY!!! LAND TAX IS BEING REPRINTED!! Aside from the foil judge promo, we haven’t seen land tax since the Battle Royale Box set in 1999, and 4th Edition before that. Not only are we seeing it again, but we get the awesome new art only previously seen in the judge promo, and it’s not a mustachioed, blue-suited businessman holding a bag of money! Hopefully this will cut a huge chunk in the $20-$40 price of this VERY good commander card. Another card we are excited to see is staple in any aura-based enchantment or voltron deck, Kor Spiritdancer. It is another expensive card, at about $8 (as of this publication date), and will hopefully go down in price with this reprint. Not only that, but we have another $4-$6 card we haven’t seen since Tenth Edition in Angelic Chorus! Token decks will be excited to see this again. Honestly I think Wizards has really outdone themselves with this set. Dominaria was phenomenal, and I’m super excited to see how this plays out adding a whole new way of introducing multiplayer to the game. This set has so much to offer, and I know it’s going to be awesome to play, and even more fun to brew with for Commander. Again, I didn’t talk much about the partners, so feel free to check out Nate’s article on the partners to see more about them and how they may work with their individual partners. To those who read the Scrambleverse, due to being out of the country, I was not able to write an article for last week, but don’t worry! I have a really exciting and awesome one coming out for next week! Until then, enjoy picking up and fooling around with Battlebond!